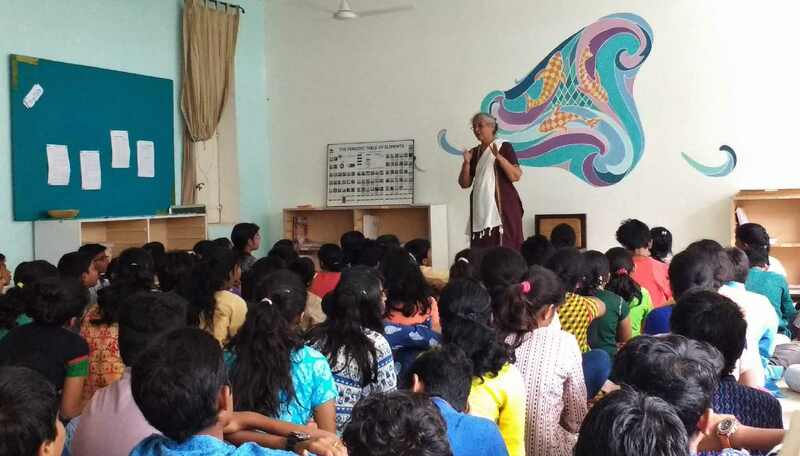 A special guest Dr. Shubhangana Mukund Atre had an interactive session with the Middle School and eighth grade students on the 17th of August. She is an archaeologist and has worked at the Harappan sites in Gujarat and Maharashtra. She has an M.A. in Sociology, an M.A. in Ancient Indian History, Culture and Archaeology followed by a doctorate in Archaeology for her thesis entitled Harappan Religion, from the University of Poona in 1986. She has written the history textbook for grades 5 and 6 which were published by the Maharashtra State Bureau of Text books. She has also submitted about 40 research papers on history and archaeology in various newspapers and magazines. Until very recently, she was a lecturer and a Research Assistant. She was involved in excavation, exploration, sorting and analyzing field data and teaching courses in Ancient Indian History and Archaeology, at Deccan College Post- Graduate and Research Institute, Pune from 1985 to 2010. Dr. Atre shared with the children her experiences of being an archaeologist. For example, she spoke to them about how she and her team would stay in tents at the sites of excavation and how joyful and exciting it would be when they excavate a bone or a skeleton or a broken clay pot. Surprisingly, the local people around the sites would think that she and her team were miners who have come there to dig gold from the ground. They used to even keep nagging Dr. Atre’s team as to how much gold they had mined so far. Only when they find out that the miners were getting excited about unearthing stuff one would find in an age-old garbage would they start ignoring the archaeologists! The children had a lot of fun listening to Dr. Atre’s anecdotes about her smart professor. It was a fun learning experience for the students and they look forward to more such sessions on what they study in their classes.